When I moved to Los Angeles 20 years ago, it didn’t take me long to discover Venice. I’ll never forget the feeling of shocked delight overwhelming my sheltered, small-town, Mid-Western sensibilities. Pizza slathered with arugula and avocado… Without a sausage and pepperoni in sight? Interracial couples walking hand-in-hand blissfully along the boardwalk? I recall anxiously looking around, making sure an angry lynch mob wasn’t lurking nearby, ready to stomp down the pier. It seems to me that Venice is a place where people feel comfortable embracing life. Unlike the sleep-until-noon-on-Saturday Hollywood crowd, residents are up at the crack of dawn walking their well-groomed dogs, grabbing French-pressed coffee before yoga class, or taking in the gorgeous sunrise. Abbot Kinney is where the action is. Once sparsely populated with antique furniture, vintage clothing, and spiritual new-age stores overflowing with towering crystals and smoldering sage, Abbot Kinney Boulevard has become the go-to spot. From thought-provoking modern art, to stylish and of-the-moment clothing with Bohemian, eclectic lean, to cutting edge restaurants showcasing fresh local ingredients, it’s all here. Give your wardrobe an update at Principessa and embrace your modern flower child side. At Abbot’s Pizza Company, have no shame wolfing down the famous bagel crust pizza (preferably the chicken curry with honey and pineapples) in front of gawking tourists. Grab a wine flight at El Vino and begin an engaging conversation with owner Bart Miali, who is only too happy to give suggestions and share his extensive knowledge of wine. There are plenty of places to break a sweat AND increase your cultural awareness. The Electric Lodge is home to locals who love taking classes at this solar-powered, visual and performing arts center. Participants can take West-African and Indian martial arts, as well as tae-kwon-do and capoeira. Dancers can let their bodies sing and pulse to Afro-Cuban, Brazilian, and tango rhythms without breaking the bank. The Hollywood “look-at-me” pretentiousness is left at the door. Moreover, Venice is rife with creative and talented musicians and singers. Visit MOMAI (Museum of Music and Instruments) to get familiar with the tapestry of this diverse, home-grown artist community. Get your groove on and become a part of history at the Townhouse, located right on Venice Beach. Patrons during the Prohibition Era enjoyed entertainment and illegal booze smuggled in from this speakeasy. It remains a popular space for Los Angeles residents to experience some of the most prolific bands and DJs around. Be sure to carve out a few moments of complete serenity. I’m not talking about spending tons of money on yoga classes. 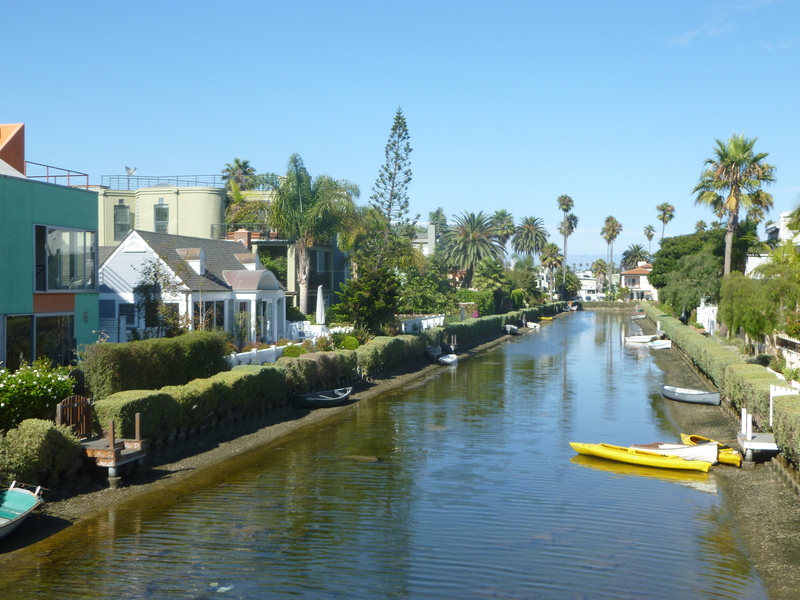 Instead, take a leisurely stroll around the Venice Canals. Designed over 100 years ago by developer Abbot Kinney, the area was built to resemble the canals of Venice, Italy. They serve as the perfect urban respite from the hustle of the nearby Venice Boardwalk and hectic LA traffic. Tourists and locals flock here to savor the scenic views: whimsical houses with perfectly manicured front lawns, romantic white bridges gracefully arching over the waters, and the shabby rowboats, regal swans and vibrant carp fish effortlessly gliding by rows of vivid birds of paradise and hibiscus flowers. This entry was tagged Abbot Kinney, Beaches, California, community, recreation, Venice. Bookmark the permalink.